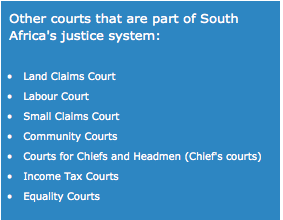 South Africa's justice system consists of different courts that deal with different types of cases. 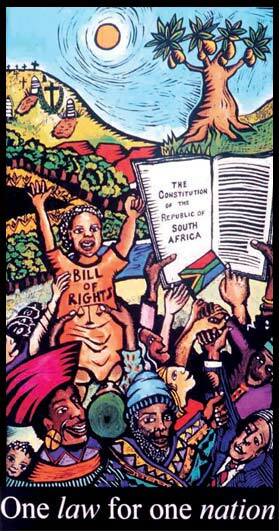 The Constitutional Court is the highest court in all matters relating to the Constitution of South Africa. It has the final say. It can, for example, decide whether laws made in Parliament and the actions of the President and Ministers are in line with the Constitution and the Bill of Rights. The Chief Justice of South Africa, the Deputy Chief Justice and nine other judges make up the Constitutional Court. The Court was started in 1994. The building is situated on Constitution Hill in Johannesburg. The Supreme Court of Appeal hears appeal cases. To 'appeal' means taking a case from a lower court to a higher court to take another look at the lower court's decision or judgement. The Supreme Court of Appeal has the final say on all matters except those meant specifically for the Constitutional Court. The Supreme Court of Appeal is situated in Bloemfontein in the Free State. The High Court has divisions in different areas of the country. The divisions of the High Court hear cases about matters in their specific areas. This includes civil matters that involve more than R100 000. Civil matters mean cases that are not criminal. In a civil action one person or group usually takes another person or group to court, mostly for money damages. The divisions of the High Court also deal with criminal cases. Criminal cases involve acts that are against the law and harmful to other people. There are 10 provincial divisions of the High Court and three local divisions. Circuit courts are part of the High Court. They travel to remote rural areas to serve people who do not have access to courts. Magistrate's courts are the lower courts. There are more than 400 magistrate's courts in South Africa. They are divided into Regional Courts and District Courts. 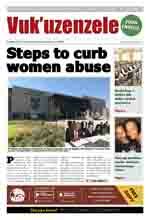 Magistrate's courts deal with most general matters, but do not hear civil cases where more than R100 000 is involved. Magistrate's courts do hear some criminal cases in the regions, but the most serious criminal cases are heard in the High Court.